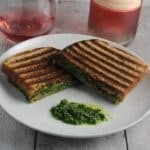 Tasty sandwich featuring savory melted cheese along with zesty kale pesto. Spread one tablespoon of the kale pesto on each of the unbuttered sides of bread. On one of the slices of bread, add the slices of cheese on top of the kale pesto. Take the other slice of bread and close the sandwich. When the sandwich is ready, use a plastic spatula to remove the sandwich from the press. Plate the sandwich, cutting it in half if you like for presentation effects. I like to serve it with a good pickle and some chips. And of course, a glass of wine. Enjoy! Amazon affiliate link included for the sandwich press that we use regularly. That means I’d earn a small commission if you should choose to click through and make a purchase.